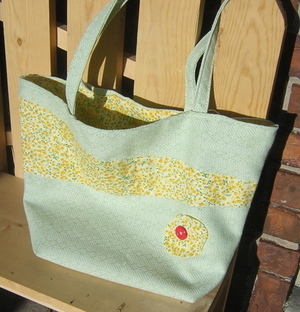 here's a bag i whipped up for my sister - she has stayed with us the last few days as my husband was away. much appreciated, kel! an extra set of eyes and hands helped A LOT! the green fabric is this cool woven vintage that my friend whitney gave to me. (a thank you will hopefully be done tonight). i love it! i'm going to have to make something for myself out of it, too. on the yellow fabric i did a little free-motion quilting to tack it down really well. i'm going to add a ribbon key-fob thing on it, as well. and this time i put a cell-phone pocket in the lining. anyway, i'm happy with how this turned out - i like the shape - i made another for a friend that is the same shape. hopefully pictures of that one soon.